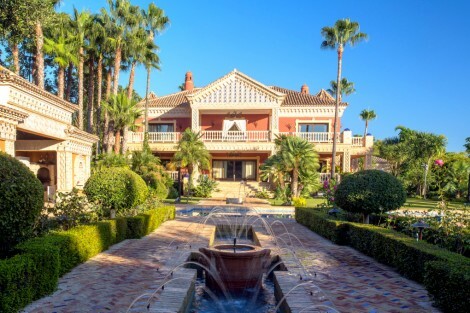 This luxury property is situated in a prime location on Marbella’s Golden Mile, has an abundance of unique features and encompasses an impressive 5,300m2 plot in an elevated position, with sumptuous gardens and sensational sea and mountain views. The villa features incredible palatial architectural details, many of which are unique, antique works of art. The majestic entrance hall is defined by sweeping dual staircases with a central, domed ceiling, which gives onto the spacious living and dining rooms. The sliding doors from the living room reveal the fabulous scenery and a long row of stunning Andalusian fountains which lead to the extensive poolside area, perfect for entertaining with a dining alcove and small kitchen incorporated. Further notable living spaces include 5 en-suite bedrooms with ample terraces, featuring a generous Master Suite with a large terrace, overlooking panoramic views, a large walk-in dressing area and private study; a separate guest cottage with 2 bedrooms with a shared bathroom; a large, fully equipped kitchen with an island and breakfast area; a beautiful, porched terrace which enjoys panoramic mountain and sea views. Other features include: Domotic system throughout, high-tech security alarm, home cinema, sauna, natural fresh water pool, 3 car garage and further parking for 4 vehicles; a lift which services all levels of the villa. 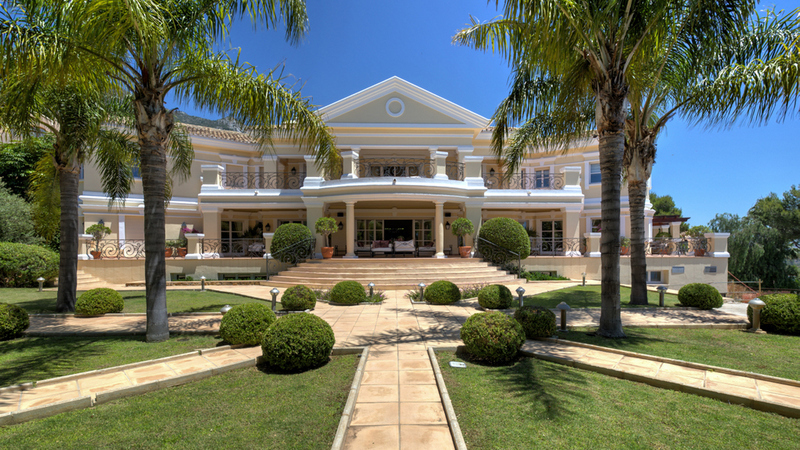 This estate is extremely private but very close to all amenities, top schools and a helipad. A must see and perfect abode for a very discerning buyer! Please, send me more information about ref W-01QY9S, Villa in Sierra Blanca, Marbella Golden Mile or similar properties.